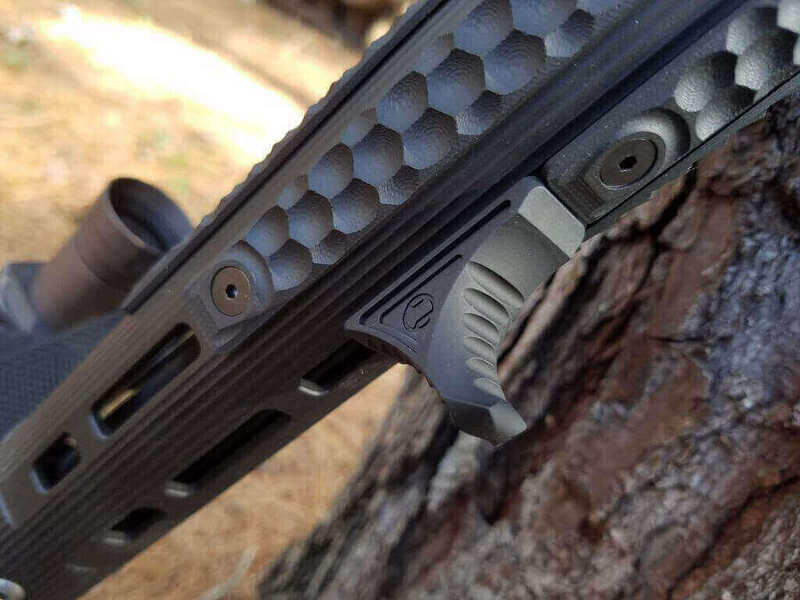 It’s no secret that Railscales panels greatly improve your grip on the rifle. They also provide an excellent heat barrier to protect your hands during long strings of fire. Since their release in 2014 there have been several upgrades and new variations released. We’re going to be taking a look at these different variations as well as all the products they offer and the information contained here should help you make the most informed decision as to which product is right for you. Available for both KeyMod & MLOK rails systems the G10 series from Railscales are the flagship product line. They are machined from high quality G10 material and offer incredible increase in grip as well as heat protection. They are available in 2 sizes per rail type and weigh just .3oz. The Keymod scales come in 2 sizes. The larger size requires 6 keymod holes and is 4.7”. The shorter version is also available and only requires 4 keymod holes (3.2”). The MLOK scales are sized for 3 MLOK slots (4.7”) and 2 MLOK slots (3.2”). Pictured left to right are: Dragon, Honeycomb & Matrix patterns. In 2018 Railscales released the XOS™ 3 sided G10 panels in both MLOK & Keymod. These feature 45 degree wings to increase coverage area and are designed to fit a variety of rails. They’re available in the Honeycomb & new Mini Dot pattern as well as the short and long sizes. They also released the XOS-H™ which offer a cutout for the Karve & Anchor handstops. The new XOS & XOS-H 3 sided panels in the mini dot pattern. Released as a more cost effective way to still get amazing heat protection and improved grip are the HTP series. These are only offered in one size (4″) but they come in a variety of colors. The patterns are the same as the G10 scales but due to the fact that they are polymer the texture of the material is a little less “grippy”. They still offer great control and heat protection but the texture of the G10 has a little different feel to it. The great thing about the HTP scales is they are about ⅓ the cost of the G10 scales so I like to keep the G10 in places where the majority of my hand contacts the rail and fill in the less used spaces with the cheaper (but still effective) HTP scales. The size of these HTP scales are also right in between the large and small G10 scales (5 Keymod holes or 2.5 MLOK slots) so between the three, there are plenty of options to get the perfect cover on your rail. Pictured left to right are the Small G10, HTP, Large G10. After years of searching I’ve finally found the perfect handstop for an AR-15. I’ve tried vertical foregrips, stops and nearly everything else you can think of. I’ve been trying to find a handstop with the smallest possible profile that will securely attach to my rail. Prior to the advent of the Karve I had been using the B5 Systems Grip Stop K. Which had its shortcomings but up until that point, fit my requirements the best. Not to go down the rabbit hole but my main complaints with the Grip Stop K was the lack of recoil lugs for the rail (it is held in place only by pressure from the attachment screws) and the fact that it wasn’t built around a specific rail type. (the universal attachments they come with are horrible so I ended up using Magpul MLOK nuts and “made it work”). The B5 was also a little larger than I needed but that wasn’t a big deal. The B5 Gripstop K pictured here with Keymod and (not so) universal hardware. Once the Karve came out and I got to spend some time behind it I realized it was the handstop I had been searching for. It’s just large enough to provide a place to rest my hand and apply rearward pressure while firing. I don’t need anything more than that so the smallest possible package is what I want. (The Karve is 2 Keymod holes or 1 MLOK slot and just .4oz.) It has recoil lugs which mean I can dig into a wall, vehicle, barricade etc and use it to stabilize the weapon without the fear of it shearing or ripping off the gun. The texture on it is perfect and it’s bi-directional so depending on the rifle, I can orient the Karve to best suit my needs. It’s made from 6061 Billet Aluminum, available in Black, Grey & Bronze and they’re all type 3 hard coat anodized. Another awesome feature of the Karve is that it uses Railscales patented COG mounting system which allows it to securely attach it to either KeyMod or MLOK rails. It features recoil lugs for both systems which will securely hold it in place while allowing you to switch between rail systems without having to buy any additional hardware. It’s a pretty innovative system and I think it will be seen on many accessories in the near future. In January 2018, Railscales announced the release of the Polyer Karve or Karve-P. This version of the karve is made from the same material as the popular HTP panels and has the same dimensions and footprint as the original Karve at nearly 1/3 the cost! The main difference between the original Karve and the new Karve-P is that the newly released Karve-P is specific to MLOK or Keymod and does not feature the innovative COG mounting system. The new Karve-P will be available in 4 different colors including Black, Grey, FDE and OD green with a retail price of just $26. This vertical foregrip for picatinny rails was originally designed for a foreign defense contract and then later released to the public after pictures from the few overruns that were sold domestically started popping up on social media. The LDAG was designed to not overhang the rail and therefore eliminate pinch points. It is bidirectional and gives you the option of either a 70 or 90 degree angles for hand placement, is Type 3 Hard Coat Anodized and takes up 4 picatinny rail section with a weight of 2.7 ounces. The texture is a honeycomb pattern machined from 6061 aluminum. This is the MLOK & Keymod compatible version of the LDAG. It features the COG mounting system originally debuted on the Karve. Just like the LDAG it features the honeycomb pattern and is machined on a 5th axis CNC from 6061 aluminum. It’s one ounce lighter than the LDAG at just 1.7 ounces. Since it uses the COG mounting hardware you can use it on either Keymod or MLOK rail systems. The LDAG on the left and the ANCHOR on the right. In this collaboration with Sage Instruments Railscales has developed the LEAF fixed iron sight for rail mounted lasers. They are currently offered for DBAL-I2, A2 & A3 lasers and are CNC machined from 6061 T6 aluminum with Type 3 Hardcoat Anodizing. When mounted to your laser it is preset for the 50/200meter zero. The use of this sight allows you to run your laser as far forward on the rail as possible without having to give up valuable rail space for a folding iron sight. It’s compatible with all standard fixed or folding rear sights. Weighing just 0.2 ounces it not only saves rail space but helps in weight reduction as well.. The Ascend grips are based off the design of the grips that Railscales developed for the Agency Arms & Nighthawk Custom Agent1 1911. They are CNC machined out of premium G10 and feature the famous Honeycomb pattern found on the Railscales panels. They’re available for both single and ambi safety 1911s. The original Railscales panels were introduced in 2014. In 2016 they redesigned them making them lighter, thinner and released 2 new textures. They also updated the S3 handstop by releasing the Karve which is a lighter, sleeker version with a smaller footprint on the handguard. The original S3 was made from G10 but they later released an aluminum version. The original Railscales Honeycomb panels with the S3 handstop.